Jonathan Sexton has been given the medical all-clear to play in Ireland's second Six Nations game against France on 14 February. The Racing Metro fly-half will sit out Saturday's opener against Italy as he completes an enforced 12-week lay-off following four concussions in a year. 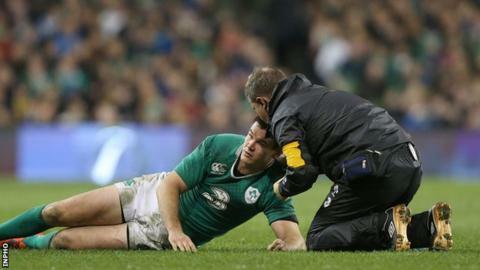 But the Irish Rugby Football Union said on Friday Sexton had been cleared to play next week by Racing Metro medics. The IRFU has also received written confirmation of this from World Rugby. Sexton's absence from Saturday's game in Rome means that Ian Keatley will wear the Irish number 10 jersey at the Stadio Olimpico. However, British & Irish Lions star Sexton, 29, looks certain to return to the Ireland team against the French in Dublin. Sexton has been out since he suffered concussion in Ireland's win over Australia on 22 November. French rugby medical authorities then stood down Sexton for 12 weeks.